Born to Nellie Petyarr at Utopia Homestead, Angelina was wife number one to artist and sculptor, Louis Pwerl (1935-1999) (Number two wife is Sarah Morton Kngwarrey). Angelina lives at Camel Camp near Three Bores in Utopia with her extended family. As senior custodians, the sisters Kathleen, Poly and Angelina Ngal share great responsibility as keepers of cultural knowledge for their country Aharlper, located in the heart of Utopia, 250 kms North East of Alice Springs. Angelina began her career in late 1979, involved in the production of Batiks at Utopia, taught by Toly Sawenko and Jenny Green prior to the introduction of painting on canvas in the mid to late 1980s. Angelina worked alongside artists such as Emily Kngwarrey, Ada Bird, Gloria, Kathleen, Nancy and Violet Petyarr. Quickly adapting to painting on canvas, it has largely been in this medium that Angelina has gained both international and national recognition. Although originally intended to facilitate an income for the community during their battle for permanent legal title to their land at Utopia, the Batik Project was highly successful and resulted in a major exhibition at the 1981 Adelaide Art Festival, ''Floating Forests of Silk: Utopia Batik from the Desert''. In 1988, CAAMA (The Central Australian Aboriginal Media Association) commissioned a number of batiks by the women at Utopia, and the eighty-eight presented, formed the opening exhibition at Tandanya Aboriginal Cultural Institute in Adelaide. After touring to Ireland, the exhibition was purchased in its entirety by the Robert Holmes a Court Collection. Earlier in her career, Angelina, when married to Louie Pwerl and living at Ngkawenterre, perhaps under the influence of her late husband, the older brother of Cowboy Loy Pwerl honed her skills as a sculptor of striking and bold simplified forms decorated with bright colours or natural ochres. Although she has sometimes been known by her husband's name, as Angelina Pwerl, Pwerl in the Alyawarr language is the equivalent to Ngal in the Anmatyerr language, Angelina is an Anmatyerr speaker. In some cases, because of the close proximity of these two language groups there has been some confusion as to the names and spelling of a number of these artists. The names and spelling in this text accords with Jenny Green who has compiled the dictionaries for both language groups. Angelina moved to painting on canvas in 1988-9 as part of the CAAMA project with the Utopia women's paintings, ''The First works on Canvas: A Summer Project'', curated by Anne Brody, and exhibited at the S.H.Ervin Museum, Sydney. Angelina does not include iconography in work which has evolved in the past decade and depicts a contemporary dialogue or translation of the cultural, geographic, social and religious components of her life. Her paintings are layered and can be read and appreciated at a superficial level for their abstractionism and painterliness. The deeper layer, which depicts the cultural and social mores of her society, requires further probing to be fully appreciated. Angelina's painting is a sophisticated play between the cultural knowledge of her country and the contemporary expression formed through the medium of synthetic polymer paint. Thousands of dots of colour are rained across her canvas denoting flora and the geographical and sacred sites of the Bush Plum. Amongst the subjects Angelina paints, is her grandfather's country, Aharlper. The landscape may appear to be harsh desert to outsiders, but to the people who live at Utopia, the subtle shifts in seasons and colours are well recognized - from the bright blue of the sky, to the myriad of greens and carpet of flowers after the rains. She also depicts ''Anwekety'', the Bush Plum (Conkerberry) and the wildflowers of her country, which she represents through a focus of many coloured dots flooding the canvas. 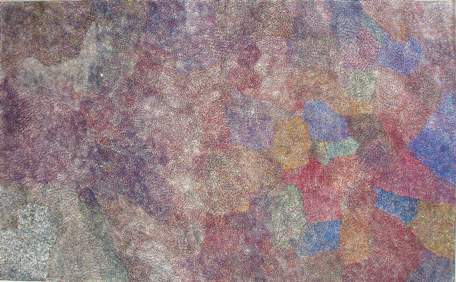 Angelina has further extended her painting of Country maintaining a layer of meaning related to the Bush Plum, but in which her translation of points of geography, elements of knowledge of places and timescapes or memories of hunting or ceremonial business, result in a subtle and textured surface that hints to the viewer of an ethereal landscape. 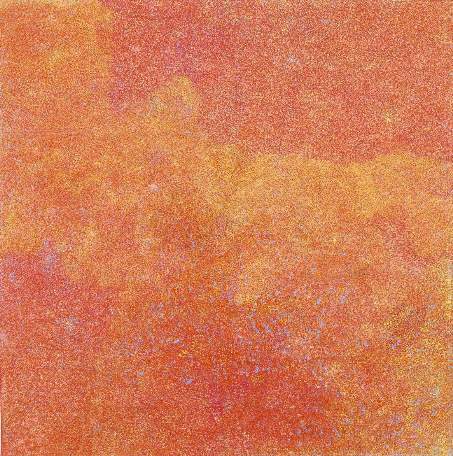 She, like the famed Emily Kngwarray (Kngwarreye), the most famous artist to emerge from Utopia, exhibits a progressive quality in her painting. Angelina also portrays her mother's country which is located near Aharlper within the Utopia homelands. On a superficial level the painting depicts the myriad of coloured wildflowers which populate the landscape in spring, however on a deeper level the story deals with various locations which are special and significant to women. In this way the painting acts like a map of the land and Angelina builds her painting up in the various layers of colours to produce a final shimmering effect. Using a handful of pointed sticks dipped in coloured paint, Angelina uses her keen sense as a colourist to enable the painting to sing. ''25th National Aboriginal and Torres Strait Islander Art Award'', Darwin, N.T. ''23ard National Aboriginal and Torres Strait Islander Art Award'', Darwin, N.T. ''Utopia Women's Paintings: The First Works on Canvas, A Summer Project'', SH Ervin Gallery, Sydney.